Remember the old saying, “He’s got bats in his belfry” used when someone is acting oddly? 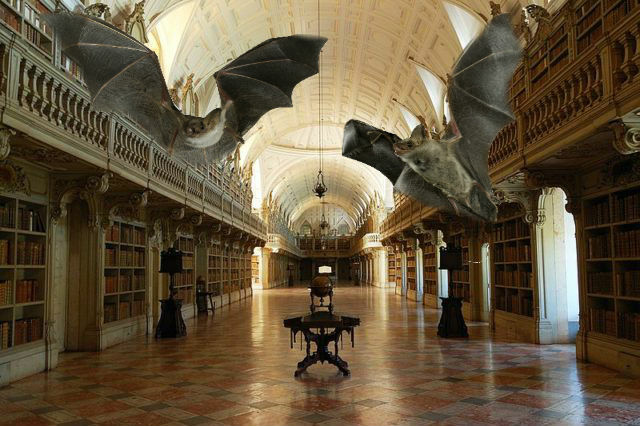 These people have bats in their library – that really is odd! 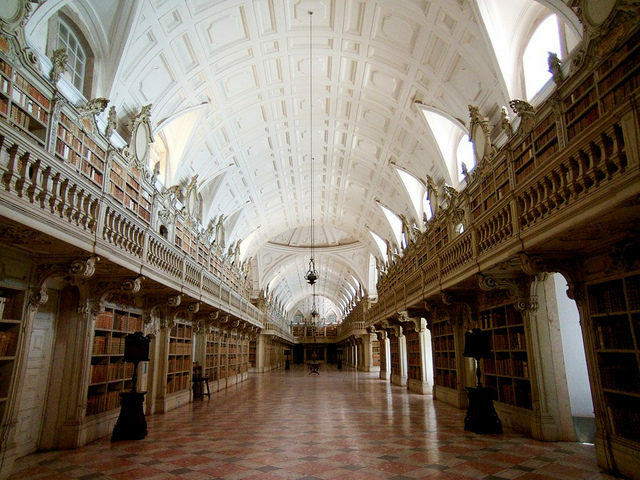 There are two 18th century libraries in Portugal that are bug-free thanks to the bats that live there: Biblioteca Joanina, located on the grounds of the University of Coimbra in the city of Coimbra, and the Palace Library in the Palace of Mafra, not far from Lisbon. Both are of a highly ornate 17th century heavy Baroque design housed in a larger complex. 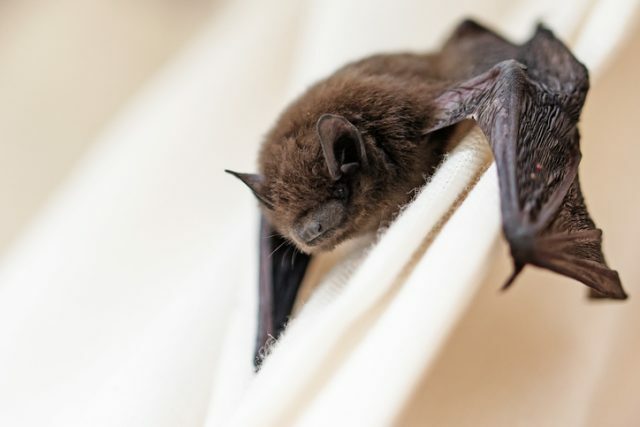 Since the 1700s and probably long before, bats have made their homes in these libraries and are not only welcome but special provisions are made to accommodate them. They sleep during the day hanging from the highest bookcases and come out at dusk to feed on the bugs that would otherwise destroy the priceless books and other volumes. Although to most people the word “bookworm” brings up images of those who read a lot, usually with big glasses, they are a very real insect. They tunnel into closed books, eating their way through and destroying multiple pages at a time. They lay their eggs and the cycle repeats. Also dangerous to the books are silverfish that come out in the dark and eat paper and book glue, and the nicobium castaneum beetle which eats paper and leather book covers. The bats are tiny but have voracious appetites for bugs. Mosquitoes are also a favorite of the airborne rodents and therefore they are welcome in many yards. They have access to the outdoors and feed in the gardens and nearby trees as well. According to Smithsonian, on cloudy, rainy evenings the bats stay mostly indoors and use bat vocalizations to “talk” to each other. The very first thing most people want to know is who cleans up what the bats leave behind. Every evening after the libraries close, the original 18th century furniture is covered with animal skins, just as it has been done for hundreds of years. Every morning before opening the floor is thoroughly swept and scrubbed by employees of the library. It’s a small price to pay for the protection of such volumes as Diderot et D’Alembert’s Encyclopédie, one of twenty Hebrew Bibles revised in the late 15th century and Homer’s Opera Omnia as well of thousands of books published from the 16th to the 18th centuries. 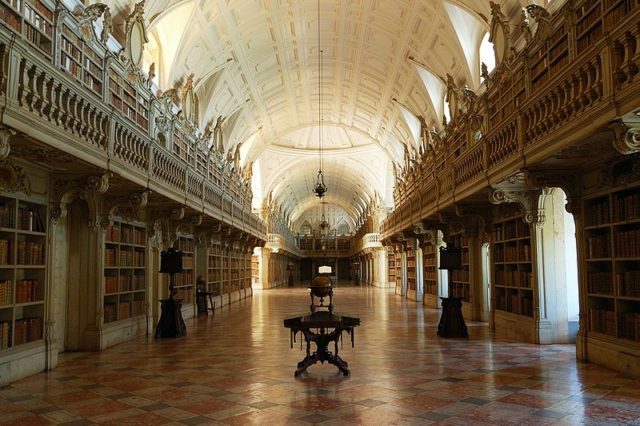 The Biblioteca Joanina, a UNESCO World Heritage site, was sponsored by King João V (also known as King John V) to be his royal library in one of the oldest universities in Europe, built in 1290. The three floors house about 57,000 volumes of written material and near the entrance hangs a portrait of the king painted by Domênico Duprà of Savoy. The floors are made from teak and the interior walls and ceilings are also wood paneled. 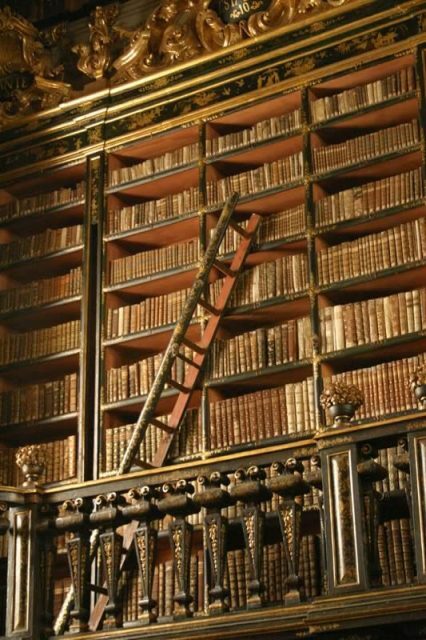 Between the wooden walls and the oak wood bookcases, the temperature and humidity stay ideal for book storage. The oak is also very hard, keeping some insects at bay. 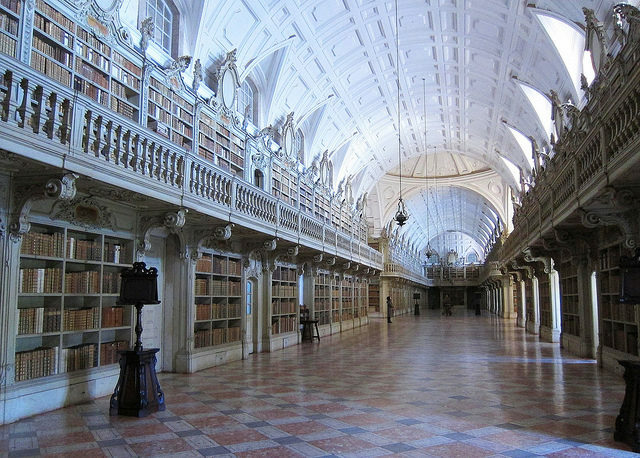 The Mafra Palace Library was completed in 1755 under King João V by Manuel Caetano de Sousa, who also bound some of the books. 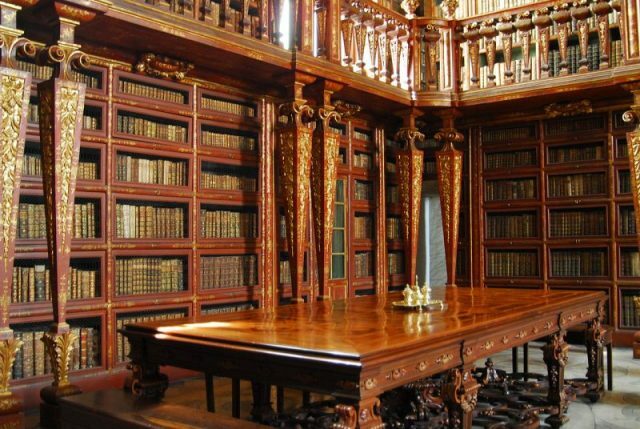 The library was decorated in late Baroque, or Rococo, style. It features two floors made of white, rose and grey marble tiles with ornate wooden balconies along the top floors. Works from the 14th to the 19th century are stored including incunabula, written volumes or papers printed before 1501 that are usually leather bound. Niches with statuary dot the walls between the bookcases, which hold over thirty-six thousand tomes.